Potato harvest at Bothen Hill completed, all safely gathered in! Loads of tomatoes now ripening in the tunnels, we have hugh beefsteaks, standard and lots of beautiful juicy cherry tomatoes. 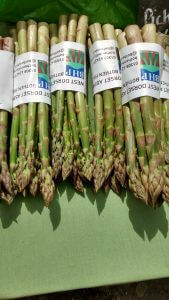 The asparagus season is well underway here at Bothen hill, where we grow 3.5 acres of the tasty spears. The season started in the last week of April when we began to harvest Gijnlim, our early variety; this has been followed be Ariane, Millennium and also Jersey Knight. Being close to the sea gives the asparagus a regular coating of salt, which enhances the flavour. We harvest the asparagus daily – this year’s yields are as a result of last year’s hot and sunny summer. To date, we have harvested well over half a ton and we hope that the crop will continue to yield well into June. Once picked, the spears are hand graded, bunched, labelled and packed prior to being hydo-chilled ready for delivery. We’d like to wish all of our customers a very Merry Christmas and Happy New Year – we look forward to seeing you in 2015. How do your potatoes get from our field to your plate? Here’s how we harvest our potatoes. Bothen Hill farm: what’s new this week? Our early Sweetcorn variety is cropping now. Recipe suggestion included! All ready for Bridport farmer’s and street markets tomorrow… we’ll have fresh asparagus, and the first of our spring onions too!